The Quest of the Sons of Turenn [The Fate of the Childred of Tuirenn]. Irish Mythology; Celtic Hero Mythological Tale. Long ago, when the people of Dana yet held lordship in Erinn, they were sorely afflicted by hordes of sea-rovers named Fomorians who used to harry the country and carry off youths and maidens into captivity. They also imposed cruel and extortionate taxes upon the people, for every kneading trough, and every quern for grinding corn, and every flagstone for baking bread had to pay its tax. And an ounce of gold was paid as a poll-tax for every man, and if any man would not or could not pay, his nose was cut off. Under this tyranny the whole country groaned, but they had none who was able to band them together and to lead them in battle against their oppressors. Now before this it happened that one of the lords of the Danaans named Kian had married with Ethlinn, daughter of Balor, a princess of the Fomorians. They had a son named Lugh Lamfada, or Lugh of the Long Arm, who grew up into a youth of surpassing beauty and strength. And if his body was noble and mighty, no less so was his mind, for lordship and authority grew to him by the gift of the Immortals, and whatever he purposed that would he perform, whatever it might cost in time or toil, in tears or in blood. Now this Lugh was not brought up in Erinn but in a far-off isle of the western sea, where the sea-god Mananan and the other Immortals nurtured and taught him, and made him fit alike for warfare or for sovranty, when his day should come to work their will on earth. Hither in due time came the report of the grievous and dishonouring oppression wrought by the Fomorians upon the people of Dana, and that report was heard by Lugh. Then Lugh said to his tutors "It were a worthy deed to rescue my father and the people of Erinn from this tyranny; let me go thither and attempt it." And they said to him, "Go, and blessing and victory be with thee." 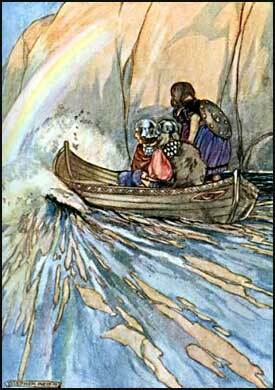 So Lugh armed himself and mounted his fairy steed, and called his friends and foster-brothers about him, and across the bright and heaving surface of the waters they rode like the wind, until they took land in Erinn. "Why do ye rise up before that grim and ill-looking band and not before us?" Said the King of Erinn, "We needs must do so, for if they saw but a child of a month old sitting down when they came near they would hold it cause enough to attack and slay us." "I am greatly minded to slay them," said Lugh; and he repeated it, "very greatly minded." "That would be bad for us," said the King, "for our death and destruction would surely follow." "Ye are too long under oppression," said Lugh, and gave the word for onset. So he and his comrades rushed upon the Fomorians, and in a moment the hillside rang with blows and with the shouting of warriors. In no long time all of the Fomorians were slain save nine men, and these were taken alive and brought before Lugh. "Ye also should be slain," said Lugh, "but that I am minded to send you as ambassadors to your King. Tell him that he may seek homage and tribute where he will henceforth, but Ireland will pay him none for ever." Then the Fomorians went northwards away, and the people of Dana made them ready for war, and made Lugh their captain and war-lord, for the sight of his face heartened them, and made them strong, and they marvelled that they had endured their slavery so long. In the meantime word was brought to Balor of the Mighty Blows, King of the Fomorians, and to his queen Kethlinn of the Twisted Teeth, of the shame and destruction that had been done to their stewards, and they assembled a great host of the sea-rovers and manned their war-ships, and the Northern Sea was white with the foam of their oarblades as they swept down upon the shores of Erinn. And Balor commanded them, saying, "When ye have utterly destroyed and subdued the people of Dana, then make fast your ships with cables to the land of Erinn, and tow it here to the north of us into the region of ice and snow, and it shall trouble us no longer." So the host of Balor took land by the Falls of Dara and began plundering and devastating the province of Connacht. Then Lugh sent messengers abroad to bring his host together, and among them was his own father, Kian, son of Canta. And as Kian went northwards on his errand to rouse the Ulster men, and was now come to the plain of Murthemny near by Dundealga, he saw three warriors armed and riding across the plain. Now these three were the sons of Turenn, by name Brian and Iuchar and Iucharba. And there was an ancient blood-feud between the house of Canta and the house of Turenn, so that they never met without bloodshed. Then Kian thought to himself, "If my brothers Cu and Kethan were here there might be a pretty fight, but as they are three to one I would do better to fly." Now there was a herd of wild swine near by; and Kian changed himself by druidic sorceries into a wild pig and fell to rooting up the earth along with the others. When the sons of Turenn came up to the herd, Brian said, "Brothers, did ye see the warrior wh' just now was journeying across the plain?" "We saw him," said they. "What is become of him?" said Brian. "Truly, we cannot tell," said the brothers. "It is good watch ye keep in time of war!" said Brian; "but I know what has taken him out of our sight, for he struck himself with a magic wand, and changed himself into the form of one of yonder swine, and he is rooting the earth among them now. Wherefore," said Brian, "I deem that he is no friend to us." "If so, we have no help for it," said they, "for the herd belongs to some man of the Danaans; and even if we set to and begin to kill the swine, the pig of druidism might be the very one to escape." "Have ye learned so little in your place of studies," said Brian, "that ye cannot distinguish a druidic beast from a natural beast?" And with that he smote his two brothers with a magic wand, and changed them into two slender, fleet hounds, and they darted in among the herd. Then all the herd scattered and fled, but the hounds separated the druidic pig and chased it towards a wood where Brian awaited it. As it passed, Brian flung his spear, and it pierced the chest of the pig and brought it down. The pig screamed, "Evil have you done to cast at me." Brian said, "That hath the sound of human speech!" "I am in truth a man," said the pig, "and I am Kian, son of Canta, and I pray you show me mercy." "That will we," said Iuchar and Iucharba, "and sorry are we for what has happened." "Nay," said Brian, "but I swear by the Wind and the Sun that if thou hadst seven lives I would take them all." "Grant me a favour then," said Kian. "We shall grant it," said Brian. "Let me," said Kian, "return into my own form that I may die in the shape of a man." "I had liefer kill a man than a pig," said Brian. Then Kian became a man again and stood before them, the blood trickling from his breast. "I have outwitted you now," cried he, "for if ye had killed a pig ye would have paid a pig's eric, but now ye shall pay the eric of a man. Never was greater eric in the land of Erinn than that which ye shall pay; and I swear that the very weapons with which ye slay me shall tell the tale to the avenger of blood." "Then you shall be slain with no weapons at all," said Brian; and they picked up the stones on the Plain of Murthemny and rained them upon him till he was all one wound, and he died. So they buried him as deep as the height of a man, and went their way to join the host of Lugh. When the host was assembled, Lugh led them into Connacht and smote the Fomorians and drove them to their ships, but of this the tale tells not here. But when the fight was done, Lugh asked of his comrades if they had seen his father in the fight and how it fared with him. They said they had not seen him. Then Lugh made search among the dead, and they found not Kian there. "Were Kian alive he would be here," said Lugh, "and I swear by the Wind and the Sun that I will not eat or drink till I know what has befallen him." On their return the Danaan host passed by the Plain of Murthemny, and when they came near the place of the murder the stones cried aloud to Lugh. And Lugh listened, and they told him of the deed of the sons of Turenn. Then Lugh searched for the place of a new grave, and when he had found it he caused it to be dug, and the body of his father was raised up, and Lugh saw that it was but a litter of wounds. And he cried out: "O wicked and horrible deed!" and he kissed his father and said, "I am sick from this sight, my eyes are blind from it, my ears are deaf from it, my heart stands still from it. Ye gods that I adore, why was I not here when this crime was done? a man of the children of Dana slain by his fellows." And he lamented long and bitterly. Then Kian was again laid in his grave, and a mound was heaped over it and a pillar-stone set thereon and his name written in Ogham, and a dirge was sung for him. After that Lugh departed to Tara, to the Court of the High King, and he charged his people to say nothing of what had happened until he himself had made it known. "O King, and ye princes of the People of Dana, I ask what vengeance would each of you exact upon a man who had foully murdered your father?" "Surely it is not the father of Lugh Lamfada who has thus been slain?" "Thou hast said it," said Lugh, "and those who did the deed are listening to me now, and know it better than I." The King said, "Not in one day would I slay the murderer of my father, but I would tear from him a limb day by day till he were dead." And so spake all the lords of the Danaans, and the Sons of Turenn among the rest. "They have sentenced themselves, the murderers of my father," said Lugh. "Nevertheless I shall accept an eric from them, and if they will pay it, it shall be well; but if not, I shall not break the peace of the King's Assembly and of his sanctuary, but let them beware how they leave the Hall Tara until they have made me satisfaction." "Had I slain your father," said the High King, "glad should I be to have an eric accepted for his blood." Then the Sons of Turenn whispered among themselves. "It is to us that Lugh is speaking," said Iuchar and Iucharba, "let us confess and have the eric assessed upon us, for he has got knowledge of our deed." "Nay," said Brian, "but he may be seeking for an open confession, and then perchance he would not accept an eric." But the two brethren said to Brian, "Do thou confess because thou art the eldest, or if thou do not, then we shall." So Brian, son of Turenn, rose up and said to Lugh: "It is to us thou hast spoken, Lugh, since thou knowest there is enmity of old time between our houses; and if thou wilt have it that we have slain thy father, then declare our eric and we shall pay it." "I will take an eric from you," said Lugh, "and if it seem too great, I will remit a portion of it." "Declare it, then," said the Sons of Turenn. "This it is," said Lugh. "The skin of a pig. "Two steeds and a chariot. "A whelp of a dog. "Three shouts on a hill." "We would not consider heavy hundreds or thousands of these things," said the Sons of Turenn, "but we misdoubt thou hast some secret purpose against us." "I deem it no small eric," said Lugh, "and I call to witness the High King and lords of the Danaans that I shall ask no more; and do ye on your side give me guarantees for the fulfilment of it." So the High King and the lords of the Danaans entered into bonds with Lugh and with the Sons of Turenn that the eric should be paid and should wipe out the blood of Kian. "Now," said Lugh, "it is better forme to give you fuller knowledge of the eric. The three apples that I have demanded of you are the apples that grow in the garden of the Hesperides, in the east of the world, and none but these will do. Thus it is with them: they are the colour of bright gold, and as large as the head of a month-old child; the taste of them is like honey; if he who eats them has any running sore or evil disease it is healed by them; they may be eaten and eaten and never be less. I doubt, O young heroes, if ye will get these apples, for those who guard them know well an ancient prophecy that one day three knights from the western world would come to attempt them. "As for the skin of the pig, that is a treasure of Tuish, the King of Greece. If it be laid upon a wounded man it will make him whole and well, if only it overtake the breath of life in him. And do ye know what is the spear that I demanded?" "We do not," said they. "It is the poisoned spear of Peisear, the King of Persia, and so fierce is the spirit of war in it that it must be kept in a pot of soporific herbs or it would fly out raging for death. And do ye know what are the two horses and the chariot ye must get?" "We do not know," said they. "The steeds and the chariot belong to Dobar, King of Sicily. They are magic steeds and can go indifferently over land and sea, nor can they be killed by any weapon unless they be torn in pieces and their bones cannot be found. And the seven pigs are the swine of Asal, King of the Golden Pillars, which may be slain and eaten every night and the next morning they are alive again. "And the hound-whelp I asked of you is the whelp of the King of Iorroway, that can catch and slay any beast in the world; hard it is to get possession of that whelp. "The cooking spit is one of the spits that the fairy women of the Island of Finchory have in their kitchen. "And the hill on which ye must give three shouts is the hill where dwells Mochaen in the north of Lochlann. Now Mochaen and his sons have it as a sacred ordinance that they permit not any man to raise a shout upon their hill. With him it was that my father was trained to arms, and if I forgave ye his death, yet would Mochaen not forgive it. "And now ye know the eric which ye have to pay for the slaying of Kian, son of Canta." Astonishment and despair overcame the Sons of Turenn when they learned the meaning of the eric of Lugh, and they went home to tell the tidings to their father. "This is an evil tale," said Turenn; "I doubt but death and doom shall come from your seeking of that eric, and it is but right they should. Yet it may be that ye shall obtain the eric if Lugh or Mananan will help you to it. Go now to Lugh, and ask him for the loan of the fairy steed of Mananan, which was given him to ride over the sea into Erinn. He will refuse you, for he will say that the steed is but lent to him and he may not make a loan of a loan. Then ask him for the loan of Ocean Sweeper, which is the magic boat of Mananan, and that he must give, for it is a sacred ordinance with Lugh not to refuse a second petition." So they went to Lugh, and it all fell out as Turenn had told them, and they went back to Turenn. "Ye have done something towards the eric," said Turenn, "but not much. Yet Lugh would be well pleased that ye brought him whatever might serve him when the Fomorians come to the battle again, and well pleased would he be that ye might get your death in bringing it. Go now, my sons, and blessing and victory be with you." Then the Sons of Turenn went down to the harbour on the Boyne river where the Boat of Mananan was, and Ethne their sister with them. And when they reached the place, Ethne broke into lamentations and weeping; but Brian said, "Weep not, dear sister, but let us go forth gaily to great deeds. Better a hundred deaths in the quest of honour than to live and die as cowards and sluggards." But Ethne said, "ye are banished from Erinn—never was there a sadder deed." Then they put forth from the river-mouth of the Boyne and soon the fair coasts of Erinn faded out of sight. "And now," said they among themselves, "what course shall we steer?" "Bear us swiftly, Boat of Mananan, to the Garden of the Hesperides"
"No need to steer the Boat of Mananan," said Brian; and he whispered to the Boat, "Bear us swiftly, Boat of Mananan, to the Garden of the Hesperides"; and the spirit of the Boat heard him and it leaped eagerly forward, lifting and dipping over the rollers and throwing up an arch of spray each side of its bows wherein sat a rainbow when the sun shone upon it; and so in no long time they drew nigh to the coast where was the far-famed garden of the Golden Apples. "And now, how shall we set about the capture of the apples?" said Brian. "Draw sword and fight for them," said Iuchar and Iucharba, "and if we are the stronger, we shall win them, and if not, we shall fall, as fall we surely must ere the eric for Kian be paid." "Nay," said Brian, "but whether we live or die, let not men say of us that we went blind and headlong to our tasks, but rather that we made the head help the hand, and that we deserved to win even though we lost. Now my counsel is that we approach the garden in the shape of three hawks, strong of wing, and that we hover about until the Wardens of the Tree have spent all their darts and javelins in casting at us, and then let us swoop down suddenly and bear off each of us an apple if we may." So it was agreed; and Brian struck himself and each of the brothers with a druid wand, and they became three beautiful, fierce, and strong-winged hawks. When the Wardens perceived them, they shouted and threw showers of arrows and darts at them, but the hawks evaded all of these until the missiles were spent, and then seized each an apple in his talons. But Brian seized two, for he took one in his beak as well. Then they flew as swiftly as they might to the shore where they had left their boat. 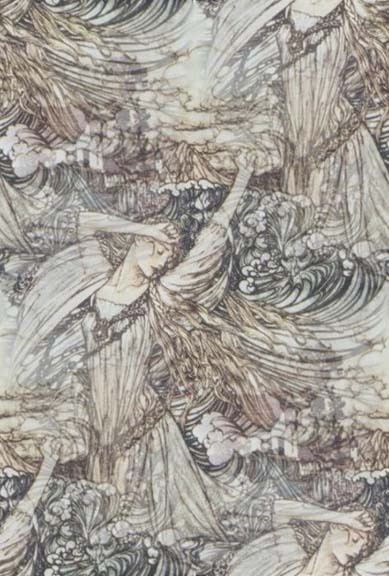 Now the King of that garden had three fair daughters, to whom the apples and the garden were very dear, and he transformed the maidens into three griffins, who pursued the hawks. And the griffins threw darts of fire, as it were lightning, at the hawks. "Brian!" then cried Iuchar and his brother, "we are being burnt by these darts—we are lost unless we can escape them." On this, Brian changed himself and his brethren into three swans, and they plunged into the sea, and the burning darts were quenched. Then the griffins gave over the chase, and the Sons of Turenn made for their boat, and they embarked with the four apples. Thus their first quest was ended. After that they resolved to seek the pigskin from the King of Greece, and they debated how they should come before him. "Let us," said Brian, "assume the character and garb of poets and men of learning, for such are wont to come from Ireland and to travel foreign lands, and in that character shall the Greeks receive us best, for such men have honour among them." "It is well said," replied the brothers, "yet we have no poems in our heads, and how to compose one we know not." Howbeit they dressed their hair in the fashion of the poets of Erinn, and went up to the palace of Tuish the King. The doorkeeper asked of them who they were, and what was their business. "We are bards from Ireland," they said, "and we have come with a poem to the King." "Let them be admitted," said the King, when the doorkeeper brought him that tale; "they have doubtless come thus far to seek a powerful patron." So Brian and Iuchar and Iucharba came in and were made welcome, and were entertained, and then the minstrels of the King of Greece chanted the lays of that country before them. After that came the turn of the stranger bards, and Brian asked his brethren if they had anything to recite. "We have not," said they; "we know but one art—to take what we want by the strong hand if we may, and if we may not, to die fighting." "That is a difficult art too," said Brian; "let us see how we thrive with the poetry." Save a pigskin for a cloak. Shall be richer than they were. Save thy pigskin for a cloak." "That is a very good poem," said the King, "but one word of its meaning I do not understand." Towering like a giant oak." "That is to say, as the oak surpasses all the other trees of the forest, so do you surpass all the kings of the world in goodness, in nobleness, and in liberality. "A pigskin for a cloak." "That is the skin of the pig of Tuish which I would fain receive as the reward for my lay." Quarrels, they are ear to ear." "That is to signify that you and I shall be about each other's ears over the skin, unless you are willing to give it to me. Such is the sense of my poem," said Brian, son of Turenn. "I would praise your poem more," said the King, "if there were not so much about my pigskin in it. Little sense have you, O man of poetry, to make that request of me, for not to all the poets, scholars, and lords of the world would I give that skin of my own free will. But what I will do is this—I will give the full of that skin of red gold thrice over in reward for your poem." "Thanks be to you," said Brian, "for that. I knew that I asked too much, but I knew also thou wouldst redeem the skin amply and generously. And now let the gold be duly measured out in it, for greedy am I, and I will not abate an ounce of it." The servants of the King were then sent with Brian and his brothers to the King's treasure-chamber to measure out the gold. As they did so, Brian suddenly snatched the skin from the hands of him who held it, and swiftly wrapped it round his body. Then the three brothers drew sword and made for the door, and a great fight arose in the King's palace. But they hewed and thrust manfully on every side of them, and though sorely wounded they fought their way through and escaped to the shore, and drove their boat out to sea, when the skin of the magic pig quickly made them whole and sound again. And thus the second quest of the Sons of Turenn had its end. "Let us now," said Brian, "go to seek the spear of the King of Persia." "In what manner of guise shall we go before the King of Persia?" said his brothers. "As we did before the King of Greece," said Brian. "nevertheless, O Brian, this business of professing to be poets, when we are but swordsmen, is painful to us." Without a wound they turn and flee. No other tree disputes its claim. Flies fiercely forth to kill and maim." "'Tis a very good poem," said the King, "but, O bard from Erinn, I do not understand your reference to my spear." "It is merely this," replied Brian, "that I would like your spear as a reward for my poem." Then the King stared at Brian, and his beard bristled with anger, and he said, "Never was a greater reward paid for any poem than not to adjudge you guilty of instant death for your request." Then Brian flung at the king the fourth golden apple which he had taken from the Garden of the Hesperides, and it dashed out his brains. Immediately the brothers all drew sword and made for the courtyard. Here they seized the magic spear, and with it and with their swords they fought their way clear, not without many wounds, and escaped to their boat. And thus ended the third quest of the Sons of Turenn. Now having come safely and victoriously through so many straits and perils, they began to be merry and hoped that all the eric might yet be paid. So they sailed away with high hearts to the Island of Sicily, to get the two horses and the chariot of the King, and the Boat of Mananan bore them swiftly and well. Having arrived here, they debated among themselves as to how they should proceed; and they agreed to present themselves as Irish mercenary soldiers—for such were wont in those days to take service with foreign kings—until they should learn where the horses and the chariot were kept, and how they should come at them. Then they went forward, and found the King and his lords in the palace garden taking the air. The Sons of Turenn then paid homage to him, and he asked them of their business. "We are Irish mercenary soldiers," they said, "seeking our wages from the kings of the world." "Are ye willing to take service with me?" said the King. "We are," said they, "and to that end are we come." "Things are going ill with us, my brethren, in that we know no more at this day of the steeds or of the chariot than when we first arrived at this place." "What shall we do, then?" said they. "Let us do this," said Brian. "Let us gird on our arms and all our marching array, and tell the King that we shall quit his service unless he show us the chariot. And so they did; and the King said, "To-morrow shall be a gathering and parade of all my host, and the chariot shall be there, and ye shall see it if ye have a mind." So the next day the steeds were yoked and the chariot was driven round a great plain before the King and his lords. Now these steeds could run as well on sea as on dry land, and they were swifter than the winds of March. As the chariot came round the second time, Brian and his brothers seized the horses' heads, and Brian took the charioteer by the foot and flung him out over the rail, and they all leaped into the chariot and drove away. Such was the swiftness of their driving that they were out of sight ere the King and his men knew rightly what had befallen. And thus ended the fourth quest of the Sons of Turenn. Next they betook themselves to the court of Asal, King of the Golden Pillars, to get the seven swine which might be eaten every night and they would be whole and well on the morrow morn. But it had now been noised about every country that three young heroes from Erinn were plundering the kings of the world of their treasures in payment of a mighty eric; and when they arrived at the Land of the Golden Pillars they found the harbour guarded and a strait watch kept, that no one who might resemble the Sons of Turenn should enter. But Asal the King came to the harbour-mouth and spoke with the heroes, for he was desirous to see those who had done the great deeds that he had heard of. He asked them if it were true that they had done such things, and why. Then Brian told him the story of the mighty eric which had been laid upon them, and what they had done and suffered in fulfilling it. "Why," said King Asal, "have ye now come to my country?" "For the seven swine," said Brian, "to take them with us as a part of that eric." "How do you mean to get them?" asked the King. "With your goodwill," replied Brian, "if so it may be, and to pay you therefore with all the wealth we now have, which is thanks and love, and to stand by your side hereafter in any strait or quarrel you may enter into. But if you will not grant us the swine, and we may not be quit of our eric without them, we shall even take them as we may, and as we have beforetime taken mighty treasures from mighty kings." Then King Asal went into counsel with his lords, and he advised that the swine be given to the Sons of Turenn, partly for that he was moved with their desperate plight and the hardihood they had shown, and partly that they might get them whether or no. To this they all agreed, and the Sons of Turenn were invited to come ashore, where they were courteously and hospitably entertained in the King's palace. On the morrow the pigs were given to them, and great was their gladness, for never before had they won a treasure without toil and blood. And they vowed that, if they should live, the name of Asal should be made by them a great and shining name, for his compassion and generosity which he had shown them. This, then, was the fifth quest of the Sons of Turenn. "And whither do ye voyage now?" said Asal to them. "We go," said they, "to Iorroway for the hound's whelp which is there." "Take me with you, then," said Asal, "for the King of Iorroway is husband to my daughter, and I may prevail upon him to grant you the hound without combat." So the King's ship was manned and provisioned, and the Sons of Turenn laid up their treasures in the Boat of Mananan, and they all sailed joyfully forth to the pleasant kingdom of Iorroway. But here, too, they found all the coasts and harbours guarded, and entrance was forbidden them. Then Asal declared who he was, and him they allowed to land, and he journeyed to where his son-in-law, the King of Iorroway, was. To him Asal related the whole story of the sons of Turenn, and why they were come to that kingdom. "Thou wert a fool," said the King of Iorroway, "to have come on such a mission. There are no three heroes in the world to whom the Immortals have granted such grace that they should get my hound either by favour or by fight." "That is not a good word," said Asal, "for the treasures they now possess have made them yet stronger than they were, and these they won in the teeth of kings as strong as thou." And much more he said to him to persuade him to yield up the hound, but in vain. So Asal took his way back to the haven where the Sons of Turenn lay, and told them his tidings. Then the Sons of Turenn seized the magic spear, and the pigskin, and with a rush like that of three eagles descending from a high cliff upon a lamb-fold they burst upon the guards of the King of Iorroway. Fierce and fell was the combat that ensued, and many times the brothers were driven apart, and all but overborne by the throng of their foes. But at last Brian perceived where the King of Iorroway was directing the fight, and he cut his way to him, and having smitten him to the ground, he bound him and carried him out of the press to the haven-side where Asal was. "There," he said, "is your son-in-law for you Asal, and I swear by my sword that I had more easily killed him thrice than once to bring him thus bound to you." "That is very like," said Asal; "but now hold him to ransom." So the people of Iorroway gave the hound to the Sons of Turenn as a ransom for their King, and the King was released, and friendship and alliance were made between them. And with joyful hearts the Sons of Turenn bade farewell to the King of Iorroway and to Asal, and departed on their way. Thus was the sixth of their quests fulfilled. Now Lugh Lamfada desired to know how the Sons of Turenn had fared, and whether they had got any portion of the great eric that might be serviceable to him when the Fomorians should return for one more struggle. And by sorcery and divination it was revealed to him how they had thriven, and that nought remained to be won save the cooking-spit of the sea-nymphs, and to give the three shouts upon the hill. Lugh then by druidic art caused a spell of oblivion and forgetfulness to descend upon the Sons of Turenn, and put into their hearts withal a yearning and passion to return to their native land of Erinn. They forgot, therefore, that a portion of the eric was still to win, and they bade the Boat of Mananan bear them home with their treasures, for they deemed that they should now quit them of all their debt for the blood of Kian and live free in their father's home, having done such things and won such fame as no three brothers had ever done since the world began. At the Brugh of Boyne, where they had started on their quest, their boat came ashore again, and as they landed they wept for joy, and falling on their knees they kissed the green sod of Erinn. Then they took up their treasures and journeyed to Ben Edar, where the High King of Ireland, and Lugh with him, were holding an Assembly of the People of Dana. But when Lugh heard that they were on their way he put on his cloak of invisibility and withdrew privily to Tara. When the brethren arrived at Ben Edar, the High King of the lords of the Danaans gave them welcome and applause, for all were rejoiced that the stain of ancient feud and bloodshed should be wiped out, and that the Children of Dana should be at peace within their borders. Then they sought for Lugh to deliver over the eric, but he was not to be found. And Brian said, "He has gone to Tara to avoid us, having heard that we were coming with our treasures and weapons of war." Word was then sent to Lugh at Tara that the Sons of Turenn were at Ben Edar, and the eric with them. "Let them pay it over to the High King," said Lugh. So it was done; and when Lugh had tidings that the High King had the eric, he returned to Ben Edar. Then the eric was laid before him, and Brian said, "Is the debt paid, O Lugh, son of Kian?" Lugh said, "Truly there is here the price of any man's death; but it is not lawful to give a quittance for an eric that is not complete. Where is the cooking-spit from the Island of Finchory? and have ye given the three shouts upon the Hill of Mochaen?" At this word Brian and Iuchar and Iucharba fell prone upon the ground, and were speechless awhile from grief and dismay. After a while they left the Assembly like broken men, with hanging heads and with heavy steps, and betook themselves to Dún Turenn, where they found their father, and they told him all that had befallen them since they had parted with him and set forth on the Quest. Thus they passed the night in gloom and evil forebodings, and on the morrow they went down once more to the place where the Boat of Mananan was moored. And Ethne their sister accompanied them, wailing and lamenting, but no words of cheer had they now to say to her, for now they began to comprehend that a mightier and a craftier mind had caught them in the net of fate. And whereas they had deemed themselves heroes and victors in the most glorious quest whereof the earth had record, they now knew that they were but as arrows in the hands of a laughing archer, who shoots one at a stag and one at the heart of a foe, and one, it may be, in sheer wantonness, and to try his bow, over a cliff edge into the sea. "There dwelt the red-haired ocean-nymphs"
"Thou art a bold man, Brian, and bolder than thou knowest; for if thytwo brothers were here, the weakest of us could vanquish all the three. Nevertheless, take the spit for thy daring; we had never granted it for thy prayers." So Brian thanked them and bade farewell, and he rose to the surface of the water. Ere long his brethren perceived him as he shouldered the waves on the bosom of the deep, and they sailed to where he was and took him on board. And thus ended the quest for the seventh portion of the eric of Kian. After that their hopes revived a little, and they set sail for the land of Lochlann, in which was the Hill of Mochaen. When they had arrived at the hill Mochaen came out to meet them with his three sons, Corc and Conn and Hugh; nor did the Sons of Turenn ever behold a band of grimmer and mightier warriors than those four. "What seek ye here?" asked Mochaen of them They told him that it had been laid upon them to give three shouts upon the hill. "It hath been laid upon me," said Mochaen, "to prevent this thing." Then Brian and Mochaen drew sword and fell furiously upon each other, and their fighting was like that of two hungry lions or two wild bulls, until at last Brian drove his sword into the throat of Mochaen, and he died. With that the Sons of Mochaen and the Sons of Turenn rushed fiercely upon each other. Long and sore was the strife that they had, and the blood that fell made red the grassy place wherein they fought. Not one of them but received wounds that pierced him through and through, and that heroes of less hardihood had died of a score of times. But in the end the sons of Mochaen fell, and Brian, Iuchar, and Iucharba lay over them in a swoon like death. After a while Brian's senses came back to him, and he said, "Do ye live, dear brothers, or how is it with you?" "We are as good as dead," said they; "let us be." "Arise," then said Brian, "for truly I feel death coming swiftly upon us, and we have yet to give the three shouts upon the hill." "We cannot stir," said Iuchar and Iucharba. Then Brian rose to his knees and to his feet, and he lifted up his two brothers while the blood of all three streamed down to their feet, and they raised their voices as best they might, and gave three hoarse cries upon the Hill of Mochaen. And thus was the last of the epic fulfilled. Then they bound up their wounds, and Brian placed himself between the two brothers, and slowly and painfully they made their way to the boat, and put out to sea for Ireland. And as they lay in the stupor of faintness in the boat, one murmured to himself, "I see the Cape of Ben Edar and the coast of Turenn, and Tara of the Kings." Then Iuchar and Iucharba entreated Brian to lift their heads upon his breast. "Let us but see the land of Erinn again," said they, "the hills around Tailtin, and the dewy plain of Bregia, and the quiet waters of the Boyne and our father's Dún thereby, and healing will come to us; or if death come we can endure it after that." Then Brian raised them up; and they saw that they were now near by under Ben Edar; and at the Strand of the Bull they took land. They were then conveyed to the Dún of Turenn, and life was still in them when they were laid in their father's hall. And Brian said to Turenn, "Go now, dear father, with all speed to Lugh at Tara. Give him the cooking-spit, and tell how thou hast found us after giving our three shouts upon the Hill of Mochaen. Then beseech him that he yield thee the loan of the pigskin of the King of Greece, for if it be laid upon us while the life is yet in us, we shall recover. We have won the eric, and it may be that he will not pursue us to our death." 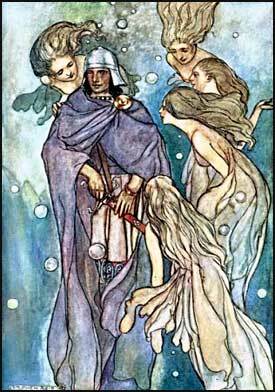 Turenn went to Lugh and gave him the spit of the sea-nymphs, and besought him for the lives of his sons. Lugh was silent for a while, but his countenance did not change, and he said, "Thou, old man, seest nought but the cloud of sorrow wherein thou art encompassed. But I hear from above it the singing of the Immortal Ones, who tell to one another the story of this land. Thy sons must die; yet have I shown to them more mercy than they showed to Kian. I have forgiven them; nor shall they live to slay their own immortality, but the royal bards of Erinn and the old men in the chimney corners shall tell of their glory and their fate as long as the land shall endure." Then Turenn bowed his white head and went sorrowfully back to Dún Turenn; and he told his sons of the words that Lugh had said. And with that the sons of Turenn kissed each other, and the breath of life departed from them, and they died. And Turenn died also, for his heart was broken in him; and Ethne his daughter buried them in one grave. Thus, then, ends the tale of the Quest of the Eric and the Fate of the Sons of Turenn. London: G. G. Harrap & Co., 1910. 22-50.